Most of the fundamental investors look at company financial statements and take their decision to invest. Financial statement analysis thus forms an essential element for investing in stock markets. There have been various instances where the financial statements are manipulated by companies and this has resulted in a huge loss for investors. 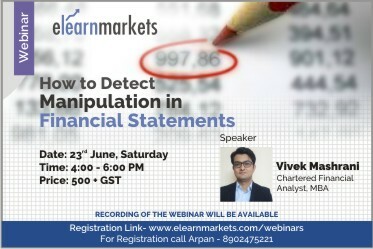 This webinar will cover a lot of tricks and areas of accounting manipulation which will enable investors to make a sound investing decision. To study various tricks, accounting gimmickry and learning key tools which can help us detect accounting manipulation. Understanding various techniques that companies use to inflate the revenues and earnings as well as manipulate various cash flow items. Laptop/Desktop, High-Speed Internet, and a good quality Headphone. I am a Chartered Financial Analyst (Virginia, USA) and an active member of Indian Association of Investment Professionals (IAIP). MBA with specialization in Capital Markets from NMIMS, Mumbai. Recently was a speaker at Traders Carnival and spoke on "Blending Technicals and Fundamentals"